You can also register for our newsletter here. Or simply have the cards ejected as soon as they are ready – in other words the Tournament director / club manager handles breaks and wants the cards to come out only when he/she decides. 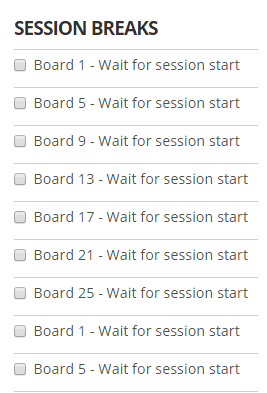 If you have a selected as shown below – because the players handle breaks and round table changes – then when board 9 have been played end inserted board 10 will be ejected (first board in round 2). This might be only relevant with a low number of tables because players have to change table or in a small private tournament. Session Management is a unique real time overview of not only the dealers, tablets both also the game.